When something goes wrong with plumbing in your house, the “fixer” can be at your door within a couple of hours. But when you discover a leak in your plumbing, it’s that not simple. Not too many plumbers make RV house calls. Whether you’re on the road as a snowbird or find a problem while prepping your RV for spring, getting a repair done at a service facility could mean days, even weeks, just waiting for an appointment. That’s an untenable situation, especially for snowbirds. In many cases, a break or leak in an RV water supply line is often a literal snap to repair. That’s because the water lines in most RVs are plastic “PEX” pipe. They are not buried inside walls and are usually accessible for easy repair. PEX stands for cross-linked polyethylene. Typically, this pipe is connected using a special tool and metal fittings that can complicate the fixing procedure for RVers. The good news is you can skip the tool altogether. Instead, use a variety of plastic fittings, some of which snap the stuff together, making repairs quick, easy, and relatively inexpensive. In RVs, manufacturers typically use translucent non-colored PEX for all runs. What is PEX tubing for the plumbing in my RV? 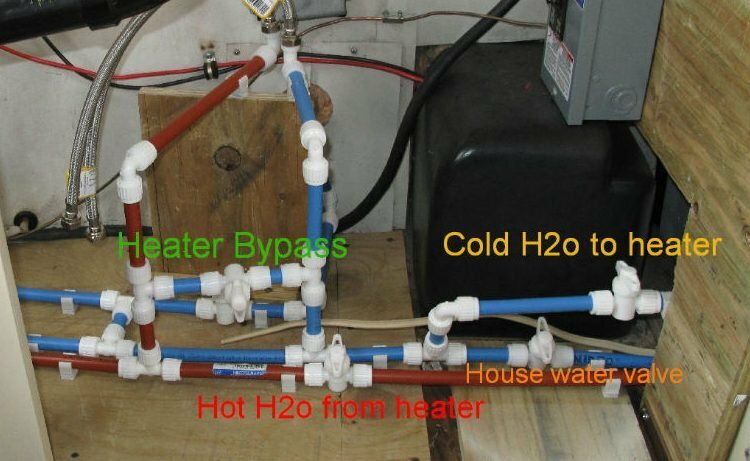 PEX tubing in homes is color-coded for hot and cold. In RVs, manufacturers typically use translucent non-colored PEX for all plumbing runs. Further, two sizes are used, 3/8-inch and ½-inch. These are the standard size because the outside diameter of the tubing is about 1/8-inch greater than the called-for size. Also, PEX is inexpensive. At one hardware store, bulk 3/8-inch may set you back 50 cents/foot. Additionally, PEX is ideal for both cold and hot water (some up to 200 degrees) plumbing. Typically, the rating is on the tubing itself. Chlorinated water is not an issue in terms of tubing or health safety. While working on water lines, you just need a tool to cut the PEX tubing itself. You can use a utility knife, but a tubing cutter designed for PEX ensures a clean, even edge. This is also a requirement for a leak-proof connection. These cutters are less than $10. I usually go with a PVC pipe cutter, which makes a clean edge and can be used on PVC pipe as well. When you need to change out your water lines, there are a variety of different fittings available. They range from simple couplers that allow you to fix a break to tees that are for jobs when adding a new run. The partial assembly of the tubing in place over the flare. The next step is to tighten the nut. Others include adapters that allow you to shift from one size of tubing to another. Want to add a shut-off valve to turn the water off to your toilet (or whatever) without shutting down the whole RV supply? Plastic compression fittings: A brand found in many hardware stores is Flair-It. These are relatively inexpensive. We bought a 3/8-inch tee fitting in a small-town hardware store, but you can also find them on Amazon. Simply, cut the tubing squarely and ensure there aren’t any burrs on the tube. Unscrew the nut from the fitting, and slide it back over the tubing. Now, push the tubing over the fitting flare, rocking it back and forth until it comes to a full stop against the fitting. Then, tighten the nut by hand until secure. Need to take it apart? Just reverse the order of assembly instructions. So, what are advantages of this? They are less expensive than quick-connect fittings. However, the disadvantages are when you are working in a cramped area. It can be a bit difficult to maneuver your hands in place to shove the tubing onto the fitting and to tighten the nut. Quick-Connect fittings: Made by Watts, these are a little more costly. A 3/8-inch coupler for joining two pieces of tubing is around $4.00. Using these fittings in a cramped area is much easier. Again, cut the tubing square and check for burrs. Slide the included “tube stiffener” into the end of the tubing until there’s resistance. Now, keep pushing until the tubing comes to a complete stop. Finish the job by inserting the included collet clip on the joint. To take this connector apart, remove the collet clip. Then, push the collet firmly against the tubing face and pull the tubing out of the fitting. Aside from an easier fix in a cramped space, there’s less water flow impediment in this design, as opposed to the plastic compression style. Both insert material into the flow, but the tube stiffener appears to block less water flow. Additionally, the Watts fittings allow you to attach to a host of other plumbing materials, including copper and CPVC. 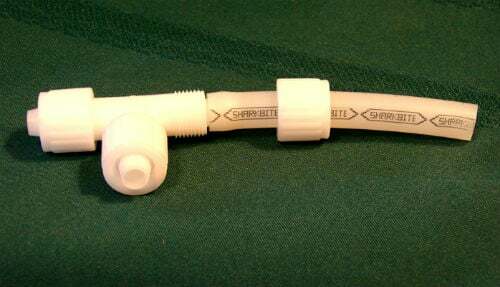 What’s more is the quick-connect fittings and the plastic compression fittings will connect directly to polybutylene tubing. You may find other brands of quick-connect fittings to meet your needs as well. Some of the larger stores sell other brands of fittings, and of course, price comparing is the order of the day. this article would only be informative to the most mechanically ignorant, which most rvers who are do it yourselfers are NOT (only do it youselfers would even glance at a subject such as this). Plus it is gravely inaccurate by claiming that plumbing is easily accessible in RVs. In my motor coach and I believe the majority of rvs the exact opposite is true and this fact is of concern to RV owners as their vehicles age and the possibility of plumbing problems (leaks) looms on the horizon. Please vet your articles carefully. Misleading novice owners is a disservice which I am sure is the opposite of what you want to be. Your critique of the article is a bit harsh. I have done several R&R jobs on my vehicles, both under the hood and in dash, unsupervised, with positive results. So, I consider myself a DIY’er. However, I have never had to do any plumbing, so this article was informative to and for me. I do agree with you in that the plumbing in RVs is *not* easily accessible. Far from it. I won’t be so harsh as len, as I thought this was an informative article, however, I agree, from my experience traveling around the country in RVs, that the plumbing can often be pretty difficult to get to . I do not consider myself “mechanically ignorant”, however I was not born with the knowledge of RV maintenance or repair and did not absorb it through osmosis. Although it seems that some readers may have those talents. The rest of us poor ignorant fools appreciate back to basic type articles like these so that we can make sure we are headed in the correct direction or learn the basics. Thank you for not assuming we are all know-it-alls and that we DIYers learn as we go. DIY is the only option for many of us, due to pure necessity. I take great pride in tackling mechanical issues that many women I know would not attempt. It amazes me what we can do when we have to and these type articles are instrumental in helping. At what point did RV manufacturers start using pex? I am in a 2002 and still have pretty drastic water pressure limits that I would like to get away from. even if the piping is pex won’t I still be limited on water pressure due to the cheap plastic water pressure valves on the toilet and other places? I already had two of these Dometic 385314349 Water Valve Assembly pieces fail due to plastic cost cutting assembly that I first thought was from water pressure. My bigger issue in my 1996 discovery with gray pipe is how to install new pex with virtually no access to shower and bath runs. Most piping must have been installed early during body construction. I realize that my motorhome is old but is still nice inside and out. I have been searching in vain for info on easy or tricks-of-trade articles. I would like to trade up, but mine is still virtually new and we love the quiet ride of the d.p. Randy, I am considering replumbing my trailer, 2017 Bighorn. I want to install a manifold system with a shut off at the fixture it supplies. My thought was to tie a cord to the fixture end and when the tubeing is pulled out you have a pull cord to help pull the tubing back in. If anyone else has had experience please speak up. That is just my take on the job. 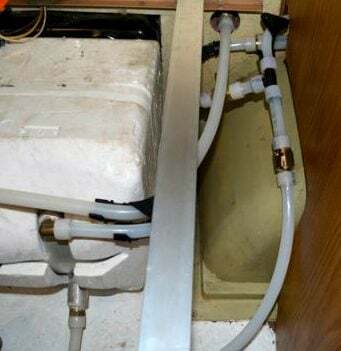 If access holes in wall and cabinet panels are big enough for a tube fitting to go through, use a coupling to connect the old and new tubing and pull the new tubing through when pulling the old tubing out. Just a thought that might work in some situations. Similar procedure can be used when installing new electrical wiring. Gosh Len, your response was a tad on the harsh side to say the least. As a full-time RVer and a motor home owner for well over 30 years I am still open to new information, tips and tricks. Even information that may appear basic to you may be quite informative to those just starting out in the lifestyle. If you are indeed as well versed as you believe that you are then perhaps sharing some of that knowledge would be a better way to express yourself. There are many of us out here who would appreciate it. I’m a DIY’er and found the article extremely valuable. I’m not a plumber, and didn’t know about Flair-It fittings. Now I do, and can go to my nearest Ace Hardware and get some for emergencies. I ‘m DIY and when it comes to plumbing for my RV it’s usually a nightmare before it’s finished. So I appreciate the advice and help now and if I could just be a contortionist it would be a bit easier. These old joints & bones don’t bend and stretch too well. I redid the plumbing in my ’83 Coachman. On demand propane water heater (I love never running out of hot water but sometimes there is not enough pressure to kick it on) , braided vinyl tubing, SS hose clamps, Brass shut offs, plastic sprinkler connectors (well, I had to skimp somewhere the hose wasn’t cheap), adjustable pressure valve. Hose clamps made it simple as possible, they have been used on heater hoses for years. I’ve seen braided vinyl tubing freeze, thaw & still not leak. So far all is well. Thanks. 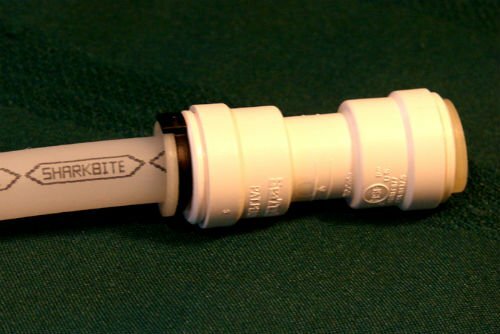 Braided vinyl Great tip. Thanks. Like probably all others, my 2015 class A motor coach has all the pipes and fittings well hidden. in walls, and under floors. While being previously aware of PEX and the specialty of the fittings, I have so far had no need to work on any. This detailed introductory article is appreciated. We have a 2002 Teton Homes that we are trying to get water to. We have water to the tube/shower, but none to the bathroom and kitchen sinks, toilet. Are there additional valves that must be opened or what.. Or do we have a kink or plug that we have not yet discovered. Any suggestions would be appreciated. Anyone with the slightest bit of mechanical fortitude can figure out how to do most any repairs on their RV. Those without any mechanical fortitude will never think to look at an article like this one or at any How-To articles, they will I fact shackle themselves to the dealerships that will charge them a huge amount of money in labor for something that may take some time and inexpensive parts. As far as getting to these types of fixtures, I am having a tough time getting to a leaky fitting up under my bathroom sink. And one of those strange types wrenches specific to hard to get into areas is worthless. I can’t even see and barely reach the fitting that needs attention. I might have to pull the whole stupid sink just to get to one fitting. I used a flashlight, mirror & my camera phone to see what was going on. I removed the fixture (old plastic), which gave me some better ideas on how to install a new one. I was able to secure the water lines before I tightened it down. Quarter turn ball valves. I think the best advice is to look at your pics, feel around & map out the area in your mind with your hands and know it. Check out some Youtube videos, you & I are not the only leaky teepees, sorry! pray! Well mission complete! Very much success! I did find a YouTube video that was nearly my very same issue. I am going to replace the pex pipes under the bathroom sink with stainless steel braided lines. Make sure you get them long enough. I got rid of all the pex. I used a couple braided lines too (some have a quarter turn shut off built in) and then switched to braided vinyl tubing stainless hose clamps & a Marey tankless water heater. I put brass pex shut offs everywhere with easy access (cheaper?, but still used hose clamps) that way I can isolate a leak, quickly & deal with it when I have time. It’s a little messy to look at but very functional & it was cold (wrapped lines & hose with ice melting cable for roof shingles & temp shut off) outside and wanted (needed) a shower (My boss said I smelled like a casino!). The more you do the easier they get. Whether it’s the roof or the plumbing the saying is not will it leak, but when? I will eventually be redoing all the fittings complete with shut off valves, but I am going to pick away at it all. I got the stainless braided hose plenty long. Actually, it didn’t look like I had much choice. I wanted 16″ 1/2 x 1/2 but they didn’t have any. 12″ I felt was too ridged so the next one up was 20″. But I ended up getting the wrong ones. All I saw that it said was 1/2″ x 1/2″ x 20″ grabbed two and took off( well I paid for them first then took off). So I then drive 25 miles to the camper and started my project. I get everything cut, I get my 1/2″ male thingy all inserted and clamped( that freaking Pex clampy thingy is some freaking expensive)I go to put on the stainless braided hose and the fitting is too small. What? I tried the other end and it fit just fine. It did, in fact, say that it was 1/2″ x 1/2″ but I noticed that it also said 1/2″ FIP and 1/2″ COMP. It was the FIP side that I needed ( whatever a FIP is) So I drive 25″ miles back get some hoses that were double FIPPED back 25 miles to the camper where I proceeded to finish my project. See I am used to things going wrong not wrong but slightly less than perfect. It’s been that way for 62 years. It used to anger me but every time that I thought something was going or went wrong I was lead to another part of the project that made that error almost justifiable. So I tried and of course, I couldn’t get enough pressure on it. So as not to get frustrated ( I don’t know about you but when I get frustrated things may go from bad to badder. I know no such word but this whole story is meant to be humorous )I used my wife’s hair dryer and heated the ends up a bit and they slid right back on like I not only knew what I was doing but like I was the BOSS! So after the rest of the finagling around I was able to complete my intended mission without any further mishaps or interruptions( One of the other campers was down opening up his camper and had to come over and tell me all about his winter. Well I live but two towns over soooooo his winter was my winter too.) Anyway, I believe that that is all I have for now. I am a pro at this now so if there are any questions please feel free to ask. I am certain that someone will read this and offer me a book deal, so that is something that you’re gonna wanna keep your eyes open for. “PEX, Piping, and Patrick: A look at Someone that Felt that Having the Dealership Come and Do This Was Going to Cost a Million Dollars So He Did it Himself for Only the Price of a Cheap Dinner Date Or a Cheap Breakfast or Even a Cheap Luncheon. Probably be out on Amazon. Next project may be the windows scraping and resealing/caulking them. Any tips or point me to another forum would be greatly appreciated. Anyway Thanks again Ed and Blessings to you and your family! So that is standard pipe thread used on rigid (brass, galvanized and black iron) pipe except on pipe and pipe fittings the threads are tapered. But on valves the threads are straight (not tapered). Really enjoyed your comments on RV plumbing repair. I’m not so young and not so intelligently experienced on repair on my 1990 Pace Arrow. Would enjoy visiting with you about my up coming project of plumbing repair. Any chance of your calling me? ( 316-409-9109 ) Would like to compare notes and ideas. I look forward to it. Thanks. Patrick, FIP is ‘Female Iron Pipe’, otherwise known as NPT-F or sometimes FPT. NPT is National Pipe Thread and M is male while F is female. This is the ‘common’ threaded pipe you’ll find most everywhere . Conversely, MIP is ‘Male Iron Pipe’ AKA NPT-M or MPT. These pipes are sized by the approximate size of the inside of the pipe. Pipes are joined and sealed by tapered threads that MUST include sealant,(normally teflon tape) to be successful. I’m not saying everybody should switch to braided vinyl tubing but it worked for me. My mechanically ignorant rv owning a$$ is grateful for articles like this one. Manufacturer of my RV went out of business years ago, so there’s no hotline I can call for assistance, and the user documentation i have doesn’t really go into details about the plumbing. Opening up the compartments I’m confronted with brass fittings with no obvious means of removal. Since I cant remove anything, I can’t figure out what size fittings or tubing I need to buy, much less how to replace my leaking water pump. Now at least I know some specifics, so I can head off for the 3rd time now to lowes and HD to at least get the right parts. Would like to finish this project quickly so I can have access to water and a working toilet, and can spend my time fixing the portion of my roof that rotted out… That project has been easy by comparison. The first thing I do is look for something familiar, in my case it was the water pump, sink faucets & who doesn’t recognize a garden hose? I must have had 20 leaks, bad water heater, furnace and refrigerator in my chipmunk condo aka ’83 Coachmen. Your not alone! In some cases it was the tenth youtube video that gave me the confidence to move forward. Anyone having same issues, past year my hot water pressure has decreased to a trickle cold water pressure normal. So far we replaced the hot water heater bypass valve no change, flushing the fresh water tank several times after adding CLR. Flushing the water heater storage holding tank several times. Nothing like taking cold showers! Hot water pressure very lot water is hot…. I’ve run out of things to check…. I went to a tankless on demand water heater. I never run out of hot water but if everyone in my section is using water & the pressure drops to low it won’t come on. What I’m saying is I’m working the bugs out & I bought the cheapest tankless I could find, I would be better running water from my holding tank but it’s not hooked up as I’m rebuilding an ’83 Coachmen, talk to some tankless installers or sellers see what they say then do it yourself. If you really want hot water & got good pressure go Tankless! Try removing the water heater water out fitting and poking around inside the tank. It is possible that some hard water residue has blocked the fitting. I bought a 3 years old 5th wheel and found several leaks in the plumbing behind the dividing wall in the basement. There are worm gear clamps and pex used. I had a plumber at Home Depot tell me you could not use pex clamps on a plastic fitting yet my RV service manager says the RV industry has been doing just that for 20 years. I followed suit and have had no issues. Never too old to learn. To clarify, the pex fittings were only used on pex hose and the worm gear clamps only used on white Camco hose.